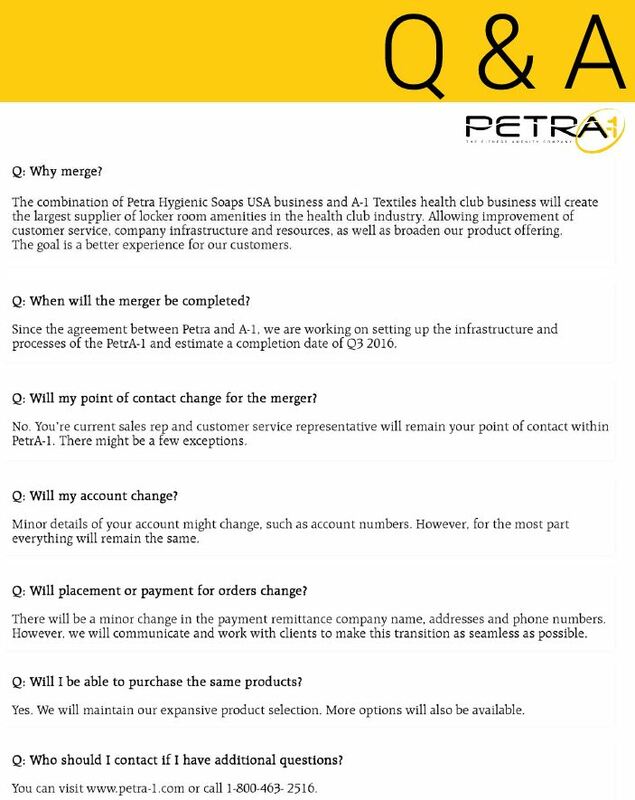 What does the Petra and A-1 merger mean for you and your company? March is always the busiest month of the year as it’s the month IHRSA which is the “World Series” of events for our industry takes place . This year, the IHRSA convention was Petra’s best ever, besides a new booth, we also announced our merger with A-1 Textiles. 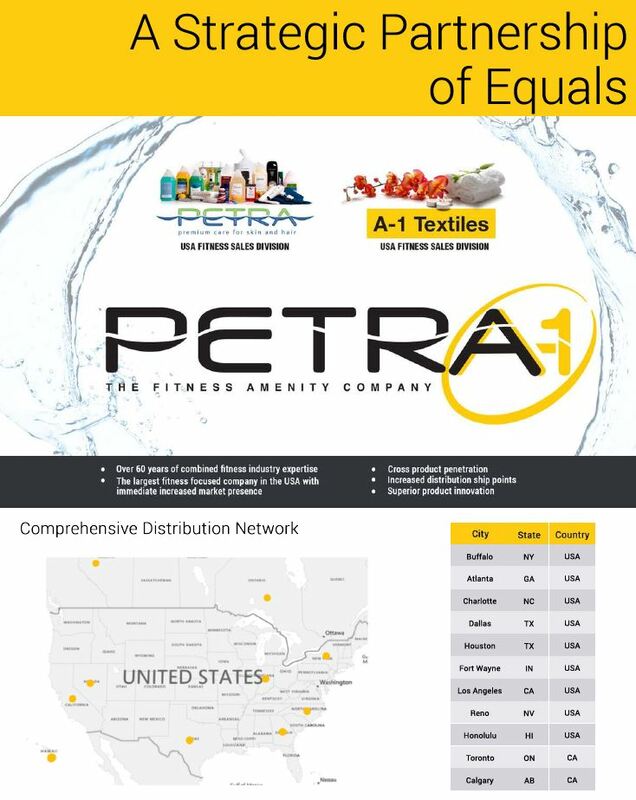 PetrA-1 is the new name for what is now the largest provider (in the athletic club and sports industry) of towels and textiles in the United States and Canada. The content regarding the merger for this Soapbox issue was furnished by the two owners of PetrA-1, Sam Maduri and Ben Whitham. Our IHRSA booth was brand new, giving us more display room for the new towel offerings, textiles, dispensers, liquids, equipment wipes and included a “selfie section”. Selfie photos are posted below for review. It was a lot of fun and we appreciate all the attendees that stopped by. Special gift offered to our Soapbox readers in California. In April, PetrA-1 is participating in the CCD Spring Symposium and Trade Show taking place in Palm Springs (April 19-21). Details are posted below. I’ve secured a limited number of free passes for this event. If you have given thought to attending and haven’t yet purchased your passes, please contact me.Passes will be awarded per a “drawing” to be held later this week. Just emailme or call me and I’ll enter you into the drawing. To help support the CCD Spring Symposium and Trade Show, PetrA-1 is sponsoring Bill McBride (president and CEO of Active Wellness & BMC3) in a keynote address. The CCD Spring Symposium and Trade Show is an opportunity for independent athletic clubs in California to come together and hear from icons and leaders on industry trends that will impact the profitability of their facility(s). This event is certainly worthy of your attendance. I look forward to meeting everyone that drops by our booth. Thank you for your faithful readership and as always, it’s a pleasure and privilege to be a part of this wonderful and healthy industry. Better Customer Service: PetrA-1 will have sales and customer service offices on both the East and West coast, meaning longer hours and better access to company representatives. Continued Innovation: PetrA-1 will have the resources to increase our investment in product development and innovation to reflect the current trends and needs of the industry. Petra Hygienic Systems has been the leading provider of liquid soaps, amenities and towels to the fitness industry, while A-1 Textiles has been leading the Hospitality industry for over 25 years. Together, PetrA-1 will create an even stronger supplier that will provide unparalleled products and service for all your locker room needs. Your business is extremely valuable to us and we thank you for your loyal patronage. We strongly believe this merger will improve our service to you and hope you feel so too. For your information we have developed a Customer Fact Sheet and Q&A document to address any questions you may have. If you have additional inquiries, please reach out to John Mickelson via email or at 775-530-7133. Featured IHRSA Trade Show Photos! You Won’t Want to Miss this Upcoming IHRSA Regional Trade Show! Spring Symposium & Trade Show! John is now offering SoapBox readers exclusive two-day passes for only $89! There will be many well known speakers to learn from and network with. See details in the event brochure here. Trade Show will be held April 19-21, 2016 at the Renaissance by Marriott Palm Springs Hotel, located at the foot of the dramatic San Jacinto Mountains.CCD Symposium room rate per night is $159. The rate is extended to the night before the event (April 18) and the night after the event (April 21). Contact Renaissance and ask for CCD Symposium rate, 760-322-6000. You can view hotel accommodations by clicking here. Previous Previous post: Towel Retention Improves Productivity and Your Bottom Line! Next Next post: PetrA-1 Joins Tom Johnston for Global Wellness Day!